We started really slowly today after a good night’s sleep. After 9am we headed across the road to sit outside in the sun in our shorts and tee shirts. A couple of coffees with croissants and pain au chocolade then back to our hotel. Mark felt like a good walk but I’m still a bit dotterery, and with only one key, Mark decided we should find an app which would let us trace each other. So, about an hour later, after considerable frustrating geeking, I headed off with my painting gear for the art gallery. They have some good work including a famous painting by Degas so it was worth a look. Heading back to the Chateaux at the other end of the town (of course) I ran into Mark, it was after 1pm so we found a nice cafe and sat outside in the shade and had a salad. 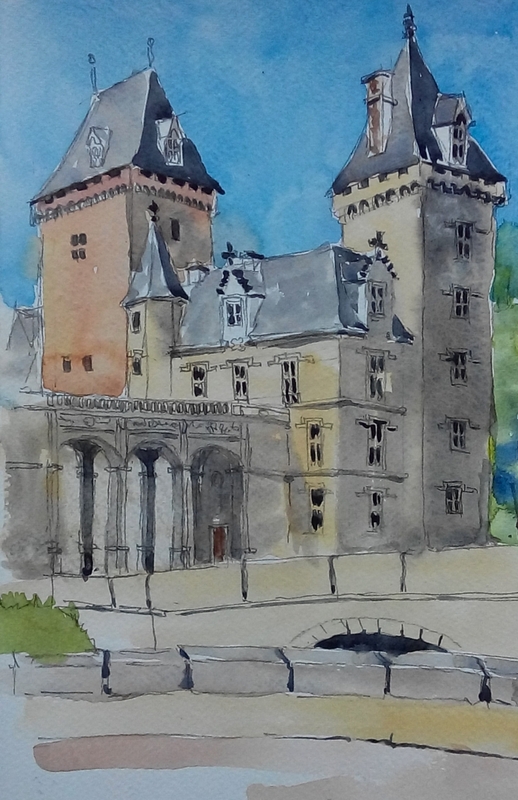 Splitting up again I spent an hour or so on a painting of the Chateaux. When I got back Mark was pretty keen on a drive so we headed off into the Pyrenees crossing the Col de Marie Blanques (about 1100 metres and pretty windy and steep) before coming back into Pau by a different route. 7.30pm now so we’re off to find some dinner. Great you and Mark are having such a good time and brilliant weather by the looks of your picture! Really enjoying your blogs, Quilliam. Hope you have a memento of the town with the cool name!